You will be surprised how easy this soup is to make and, while it might not sound very inspiring, you'll be delighted with how delicious this soup is. Cook till peas soft and mix to make a puree. Add creme fraiche and bring to boil. Mix 15g butter and 1 cs of flour and incorporate. Fry lardons and add at the end. 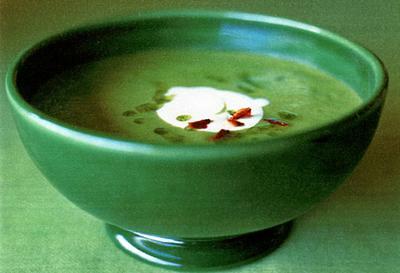 As well as the lardons, some parsley can be used to garnish this soup. I highly recommend this soup. It is super (LOL) easy to prepare, ready to eat very quckly and really delicious, heart and warming. YUMMY!! !